Understanding multicultural feminist perspectives is vital for clinicians working to effectively help women in therapy. 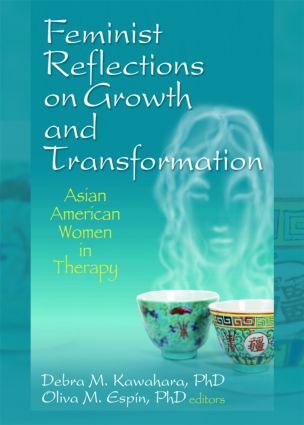 Feminist Reflections on Growth and Transformation: Asian American Women in Therapy provides therapists with valuable insight and research into the identities of Asian and Asian American women, all toward the crucial goal of being more effective when providing therapeutic help. In-depth explorations into the women’s personal experiences and psychological issues provide an empowering multicultural feminist viewpoint that challenges assumptions and stereotypes about their identities while presenting innovative therapeutic approaches. Identity is made up from several factors, such as worldview, beliefs, values, race, ethnicity, gender, sexual orientation, class, age, and religious orientation. Feminist Reflections on Growth and Transformation: Asian American Women in Therapy explores how these common factors impact psychotherapy approaches for women of Asian American backgrounds. This unique text presents the current research, what the data mean for adjusting clinical strategies, and personal accounts from Asian and Asian American women. Each chapter is extensively referenced. Feminist Reflections on Growth and Transformation: Asian American Women in Therapy is an insightful exploration of the culturally sensitive knowledge and skills clinicians need to work more effectively with female clients of Asian ancestry. This stimulating work is important reading for therapists, counselors, psychologists, and others in the mental health and social work fields.